In Nebbi Diocese of NW Uganda there are many worn-out lands. Burning hot lands for man and beast. Hunger lurks close by. The rains are erratic and the dry seasons often longer than they used to be. So World Renew and our partners from the Anglican Church of Uganda ask these questions: Should we wait around while we blame industrialized nations for climate change? Why did God put us here, now? What can we do right here to restore the earth? One answer has come about. Look. See those stumps with those tangles of regrowth shoots? Those stumps have an underground forest of living roots—and underground forest we can care for to make it flourish again. 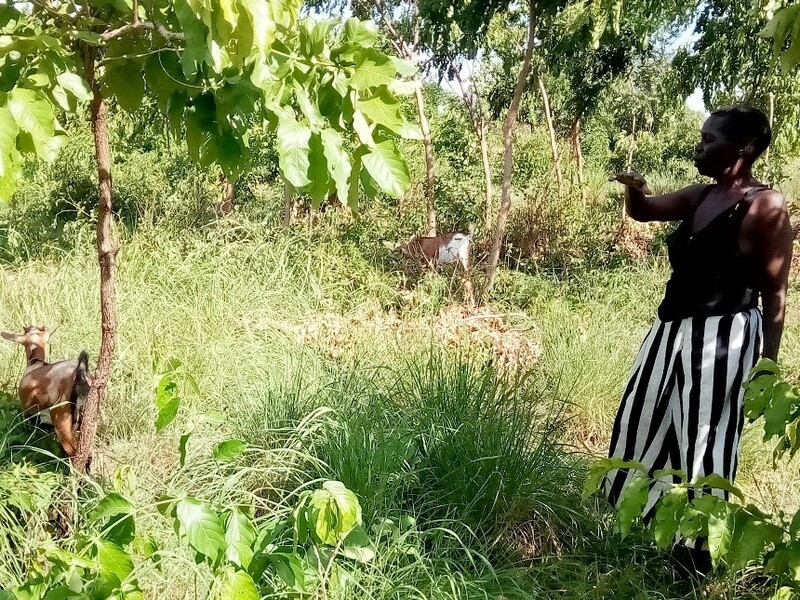 Here Costa Mary shows how small the trees in her land were when she started restoring it. 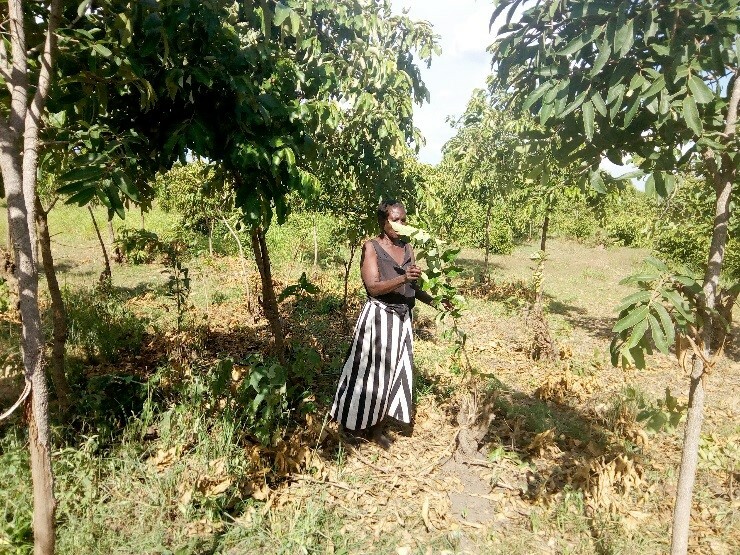 She explains to other farmers how she took a worn-out piece of land and pruned the shoots from many to only 2 or 3. Her vision was to create a land where grass for her goats would flourish and where she could obtain fuel wood. 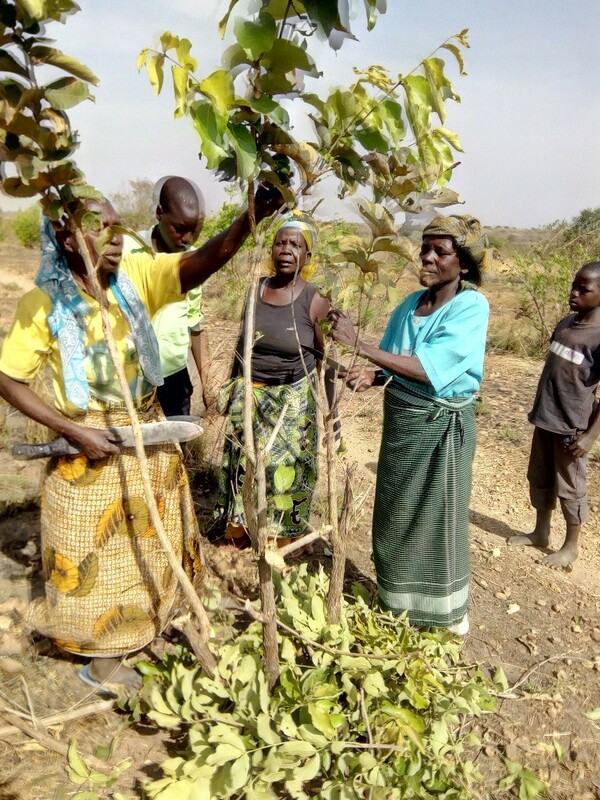 Other FMNR farmers choose trees for the flowers that they know their bees will like, others choose trees that they know are good for building, for medicine, or for feeding animals. So, you might ask: How do Costa Mary and her neighbors agree about keeping each others’ hungry goats and cows or each others’ fires out of their regenerating patches of trees? Answer: They have “by-laws” in their village. These stipulate that when someone lets her goat eat another person’s tree that goat must be given to the person whose trees were harmed. Implications: First, you tether your goats when you take them to eat and you watch them to make sure they don’t wander into your neighbor’s trees. Secondly, to prevent the escape of fires each one slashes a fire prevention corridor around their land. There is more: the farmers have learned that returning the vegetation to their land instead of burning it increases the soil organic matter and fertility; and that it was their over reliance on selling charcoal that was denuding their lands. So far, most of Costa Mary’s neighbors who are restoring their lands from the underground forests work for a vision of having better land for their animals to graze, for fuel wood, or for medicinal trees. A few of these Ugandan farmers are trying to grow climbing beans, yams, or passion fruits next to the trees. But, most do not have a vision of planting crops between the trees….and that’s ok. 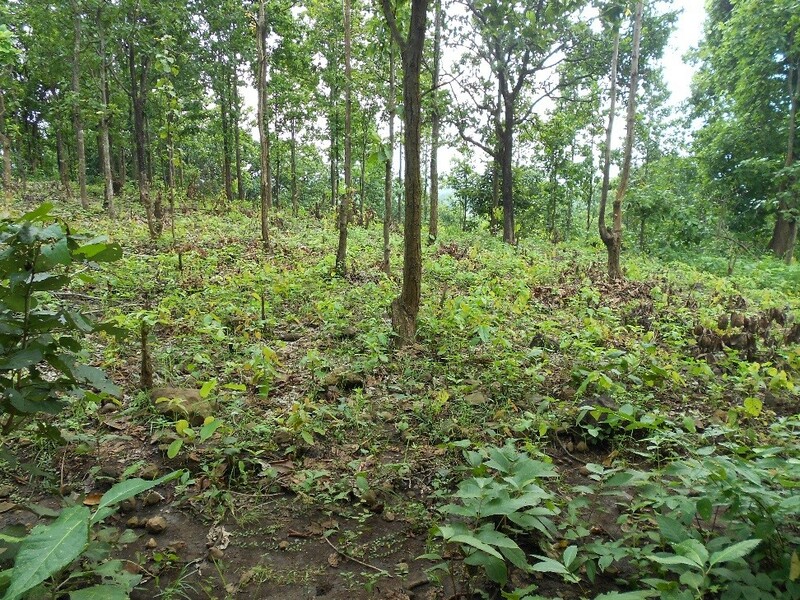 However, in World Renew’s work in Jharkand State, Indian farmers are also starting to regenerate their underground forests. Here they are selectively pruning and spacing the re-growing trees so that crops can be grown in the partial shade. People need to see the need or they won’t change. In Uganda people can feel the lurking hunger and the burning big sun. But it is an art -to lead people to see the need and to seek options for a way forward. Then/Now/Future: Older people can remember the trees and the shade of 30 and more years ago, they can compare with how things are now, and then they can envision a better future. Learning new ways together: With our partners, our World Renew team in Uganda was trained in FMNR- at the same time and at the same place.